The annual visit to Portmeirion may have been a low-key event this year, but it's been in the diary for a long time, and I've had plenty of time to plan for it. The choice of bike was not going to be particularly difficult, though it changed late in the day due to the last minute acquisition of the Airnimal. For luggage carrying for Portmeirion, I spent a long time analysing the options, comparing the weight and capacity and convenience, both while travelling fully loaded to and from Portmeirion and for day rides while I was there. Some of this investigation was carried out before I decided on the Airnimal, so was based on a Bike Friday, although the move to the Airnimal had little effect on the options and choice. I even went as far as putting all the data into a spreadsheet! My preference was for a saddlebag, using an old Karrimor made of Silvaguard - exceptionally light and with reasonable capacity. Capacity was nevertheless the real question with this solution, as for a week away I find it a bit limited - more because I invariably carry a lot of Portable Paraphernalia with me (for my trip to Cambridge to collect the Airnimal, for example, I had a Handspring Visor, folding keyboard, mobile phone and camera apart from the essentials). Carradice make some nice saddlebags, but they are generally a bit heavy, and certainly the current large models would weigh much more than the old (now obsolete) Karrimor one. Mounting a saddlebag can be a problem nowadays, as the old Brooks B17 is about the only saddle with built-in loops. You can buy bolt on loops for other types. However, without some form of support a saddlebag tends to hang at an awkward angle, and swing about inconveniently. The old Carradice quick release system is a bit of a pig to fit, and quite heavy, but they have just launched a new SQR model intended for mounting on a seat post instead of onto the saddle itself, so I decided to try one of these. Incidentally, although this can be used with existing designs of saddlebag, Carradice are also going to launch a new range of bags designed specifically for this new quick release system. Rohan - ordered from web site on Monday morning (11th). Not delivered in time. On-Line Direct (Parrot) - ordered from web site on Monday morning. Not delivered in time. St John Street Cycles - ordered from web site on Monday morning. Delivered Friday morning. Settle Cycles - ordered by telephone Monday afternoon. Delivered Wednesday morning. So the various cycle bits arrived, but unfortunately the new wet weather gear did not - a cause for concern, and something I was to regret even more later..
After a big struggle I finally worked out what to take and squeeze into my luggage - I could always have used the rack and a couple of small panniers, but I was keen to keep the weight down. Apart from a minimum of clothes, additional Rohan Bags for off cycle wear and in case of getting wet, change of socks and underwear and a shirt for off cycle wear and in case of cold weather, I took the Coolpix 990 digital camera, a Pentax ME Super and pancake 40mm lens, film, a Compaq iPaQ PDA, mobile phone (this proved to be a waste of time, as it developed a fault), PC card modem, batteries and chargers, plus of course a small toolkit. Apart from the saddlebag, I had a medium sized waist bag to hold the things I might need quick access to on the way to and from Portmeirion. In the past a group of us will travel down together, and I would get on the train at Wolverhampton mid-morning to join them. This year, however, the others decided to take a slightly later train (to avoid them having to make such an early start from Bristol and other points south), so I decided to be unsociable rather than 'waste' the morning doing nothing, and catch an early train from Wolverhampton to Machynlleth. From there I could 'change' (actually the train splits) to a train to Barmouth (that particular one terminates there, rather than going on to Porthmadog and Pwhelli), and cycle from there via Harlech, or be more ambitious and cycle from Machynlleth. The choice was to depend on the weather - really wet and horrible, and I would wait for the later train and travel down with the others, uncertain, and poor when I got to Machynlleth, and I would train to Barmouth and ride from there, and reasonably good and (assuming I felt fit enough) I would cycle from Machynlleth. On the day (Monday 20th) the weather was reasonable when I cycled down to Tipton to catch a local train to Wolverhampton, and I had plenty of time there to fold and 'bag' (cover) the Airnimal. The train from Wolverhampton arrived just a couple of minutes late, and it proved easy to load the bike on the train (class 158) and stow it in the narrow luggage space at the end of one of the carriages (these trains actually have a much larger luggage space at the end of some of the other coaches). The bars would not quite fit into the gap, but did not project into the corridor; although I stowed the front wheel and saddlebag above the bike, they would have fitted into the lower space alongside it. The journey went according to plan, but the weather looked far from settled, so when we reached Machynlleth I decided to stay on the train through to Barmouth - as the heavens opened shortly afterwards I was glad I made that decision! At Barmouth it was dry again, so I reassembled the bike and refitted the luggage - not perhaps as easy as with a Brompton, but quite straightforward. As it was still not 12.00, I decided to extend my ride by going back towards Dolgellau via the A496, then a toll road (where I had to pay 25p even with a bicycle), the A493 and then the A470 past Trawsfynydd, turning left to Maentwrog before reaching Ffestiniog. From there it was downhill to Penrhyndeudraeth and on to Portmeirion. These may have been 'A' roads, but in this area and at this time of year there was very little traffic. I expected to be the first to arrive, but it turned out that most of the others had caught an earlier train than originally intended, due to uncertainties of rail travel, and they were there before me. There had been some rain during the ride, but not too much, and the bike behaved faultlessly - very comfortable, ample gears even without the wider range sprocket set, and confidence inspiring brakes. The only problem I had was with luggage - I had rather over filled the large bum bag, and it was causing me some discomfort, but I did not really want to stop in the damp conditions and try to redistribute the load. I had been worried that with no front mudguard I would get very wet and dirty, but surprisingly this was not the case - the combination of a very narrow front tyre and the very substantial frame tube seem to prevent much reaching the rider - better than on some of my bikes which do have a front mudguard. Not much was planned for Tuesday, so I cycled out through Porthmadog to Criccieth, and from there on to Llanystumdwy, where the large amount of rain recently made the River Dwyfor quite spectacular, and then further on towards Pwllheli, before turning onto the B4354 through Chwilog. I then followed some lanes over the hills before coming back into Criccieth - a fairly similar route to one of my rides on the SP last year with Derek and Michelle, and as on that occasion I got lost despite having a map. The roads were very wet, though no rain fell during the ride, and once again the rear mudguard and the narrow tyre/substantial frame tube prevented any significant amount of dirt or water reaching the rider. At one point the road was decidedly slippery, and although I was going quite slowly I thought I was going to come off. The Kenda tyres are quite narrow (25x520) and have only a very light tread, and after that experience I rode the wet roads with even more care than before. Wednesday was one of the two week days on which the Ffestiniog Railway was running, so we caught the train at Minffordd. 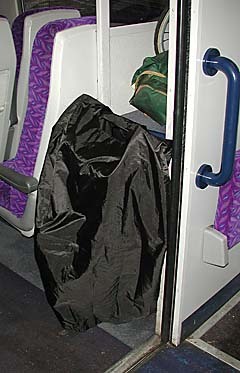 The Airnimal folded easily enough, but the narrow doorways of the carriages made it a bit awkward to load and unload, due to the width of the handlebars, which were left in the normal riding position. The others got off at Tan y Bwlch, but I opted to go on up to Blaenau Ffestiniog, with the prospect of the exhilarating descent. This proved to be a mistake - torrential rain started just after we got to Blaenau, and the combination of rain, a lot of diesel fuel on the road and a strong, gusty wind made the descent extremely unpleasant. I slightly extended my route back to go via Maentwrog and the toll road back into Penrhyndeudraeth, but the conditions were pretty unpleasant, and I really did not feel like going any further - only about 20Km in the day. Happily the conditions improved in the afternoon, and we were able to go onto the beach walking and taking photographs. 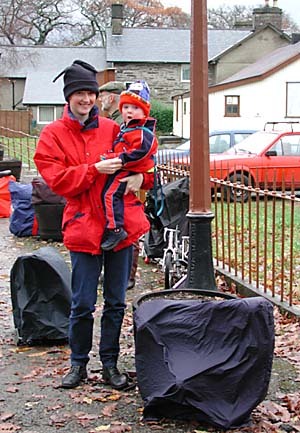 Photograph: Jane and Alexander surrounded by folded bicycles and trailer at Minffordd station on the Ffestiniog Railway. Thursday was the day when some of us went a rather longer ride towards Caernarfon on the A4085, to see how far the Welsh Highland Railway had got. Fortunately the weather was quite reasonable, and we got to Waunfawr, which is where the line currently finishes, although construction work is going on further along the proposed route. The road climbs fairly steadily for most of the way there, but with some sharp ascents on the stretch out of Penrhyndeudraeth, which reduced me at one stage to the lowest gear. The last stage to Waunfawr seemed to involve several descents on the way out, but perhaps it is a measure of the performance of the Airnimal that they seemed only very gentle climbs on the way back. Once over those, there was a long, enjoyable descent back to Porthmadog before tackling the last stage back to Portmeirion. All too soon it was Friday, and time to return. Most of the others were catching the early (08:27) train from Minffordd, but David Edge and I decided to cycle to Barmouth and catch the next train from there. This seemed a good idea at the time, but about 20 minutes into the ride torrential rain started, and showed little prospect of clearing. By the time we reached Harlech we were absolutely soaked, and riding into a head wind (though not a very strong one), and we decided to stop and catch the train there - even though it would mean a wait of over an hour. Soon after that, of course, the rain stopped, and it went a bit brighter. We therefore decided to resume our ride, and although the rain started again, it was relatively gentle. Even so, it wasn't a particularly enjoyable ride, and I again had to resort to bottom gear at one stage - the climb out of Harlech. We got to Barmouth with just over 5 minutes to spare, at which point the train was just about on time. Regrettably it lost time steadily from then on, and by the time it got to Wolverhampton it was almost an hour late. Folding and unfolding the Airnimal again proved no problem, but I seemed on the way back to have lost the knack of carrying it, the wheel and my luggage, and had a considerable struggle getting on and off the train with it - I obviously need more practice. Over the 5 days I covered just over 250Km - a reasonable but not outstanding distance. If the weather had been a bit better, I might well have done more, but anyway this is not intended as a purely cycling holiday, it's a time for socialising and relaxing as well. I probably intended to, and actually did, cycle more than the others, and with this in mind I'm very happy with the choice of bike I made this time. 5 days away, and only needing to travel by train to and from the Portmeirion, and once on the Ffestiniog Railway, with a moderate amount of cycling in between, a machine like the Airnimal which can be folded but is a really superb bike to ride seems the best choice for me. For journeys involving more folding and less riding, a Brompton certainly can be better, but would have either restricted my cycling on this holiday, or would have made it less enjoyable. When I was planning what to take a few weeks ago, before I had any thought of getting the Airnimal, I originally thought I would take the SP, like last year, and I still think this would have been a very suitable machine. However, as the time got closer I started having more ambitious cycling plans for the week (they did not come to fruition due to the weather), and I decided on a Bike Friday, probably the Rocket as it had not been to Portmeirion before. The Airnimal was the final choice as much because it was new as for any other reason. I generally don't like to use such a new bike for an extended outing - not so much that I am worried about any major problem, but simply that I haven't had a chance to set it up just how I want it - although I took the New Series Moulton to Scotland last year with just as little time to prepare it. So what's the verdict on the Airnimal now, after 250Km, but bearing in mind that I still haven't had a chance to experiment with setting it up exactly as I want it? As I said above, I think that for my purposes it was as good a choice as any for this particular event. Ride comfort was good - the combination of larger wheels, rear suspension and carbon fibre forks work very well - not as much road insulation as a Moulton or Birdy, but more than adequate for most purposes. The riding position is pretty much as I would choose for a road bike with dropped bars, even for semi-touring use as opposed to riding fast with no load. I would not want the bars any further away or any lower, though, and even allowing for my small stature, I would think that some riders would prefer a stem with a shorter reach but higher. The range of gears proved adequate in this moderately hilly area, and carrying a light load at some times, even for a not very strong rider like myself, though I will be happier when I have changed from the original 12-23 to a 12-27 sprocket set. The Shimano 105 STI system works as well as we have come to expect, though I must say I prefer the Campag Ergo levers (but not their very limited gear ranges!). The brakes are powerful and very progressive. Once on a slippery lane I nearly came off at low speed, and when I failed to steer round a metal cover on one occasion the bike squirmed uncomfortably - the narrow Kenda tyres need to be treated with some caution, but without riding something else on the same roads I'm not sure they are any more 'nervous' than, for example, Primos on a Brompton, City Jets on a Moulton APB or NWT, or IRC Roadlites on a Pocket Rocket. The choice of tyres in this size seems quite good, but for some reason errs on the side of fast road tyres with apparently not so much choice of more robust touring tyres; the semi-knobbly Specialised tyre is something I ought to give a try, but what I'd really like to try would be a 28 or 32 width with a moderate tread. The Kendas certainly seem to run very freely though. The rear mudguard proved very effective at keeping me clean on dirty, wet roads, and more surprisingly, the absence of a front mudguard (which interfered with folding) didn't cause me any discomfort as the narrow tyre and large frame tube seemed to result is little spray being thrown up onto the rider. It's certainly a pity the front mudguard can't readily be used if you want to fold, and the back mudguard tends to take rather a bashing when you fold and stand the bike on it. I think the Bike Friday mudguards, which are flexible and held by a single allen-key bolt, are a much nicer solution, even if they are rather ugly in appearance. As mentioned earlier, for this journey I spent a lot of time trying to work out the best combination of luggage, and finally opted for an old fashioned saddlebag (and an old bag at that, the relatively light Karrimor in the Silvaguard material), fixed to the seatpost using the new Carradice SQR mounting system. I have only used this bag for touring once before, when I fitted it via the old Carradice QR system to the saddle of the Birdy for the Ffestiniog - Bala - Llangollen ride. The new SQR fixes much more satisfactorily than the old QR, which it was difficult to clamp properly onto the saddle rails. The capacity was a bit marginal, but this particular bag is light - Carradice make nice bags, but they are generally very heavy, and Karrimor and most other manufacturers seem to have dropped out of that market. Carradice are planning some new bags specifically intended for the new SQR system, so it will be interesting to see what they are like. Although the new SQR is still quite heavy - almost the same as the old QR - it works well, providing you have enough seat post exposed to mount it. The release mechanism works well and quite easily, but on rough surfaces the bag and the section of the SQR attached to it could be heard bumping around - there seems a surprising amount of lateral movement between the two parts of the SQR. When I used the rather similar set-up on the Birdy I was not happy with the arrangement - apart from the difficulty of attaching the QR tightly to the saddle rails, it felt as though the weight was affecting the handling of the bike, and possibly inducing some twisting. The Airnimal felt quite unaffected - it looks and feels much more strongly made than the Birdy, and is if anything lighter. Over the last 5 years I have taken a Bike Friday NWT, standard Brompton, Birdy Red, SP and the Airnimal to Portmeirion. The first year we did a lot of folding and very little riding, for which the NWT was not a great success, and this year the weather did reduce my planned riding a little, if not much. For these 1 week holidays, with a train journey at the start and end, and a modest amount of riding in between, all the machines are quite suitable, with the SP and Birdy scoring on foldability while still being good for the longer rides, and the Airnimal being the best for riding, but with a loss of foldability which was acceptable for this type of outing. I'm very pleased with the Airnimal so far - it may not be the right machine for a lot of people who want a folder, but for what it is intended for it is excellent. It's just a pity in a way that there are two such good bikes as the Airnimal and the Pocket Rocket for one, limited, part of the folder market, while other sectors are still rather under served. Paul Stobbs was using the Panasonic Traincle, like last year, although it has apparently not had a lot of use since then. It's certainly very light, but the single gear would prove a serious drawback for most people - Paul can go faster than most us uphill even with only the single gear, but that's down to Paul rather than the bike! Philippa Wheeler had travelled to and from the event by car, and so had a choice of a Brompton, which she used most of the time, and her power assisted Micro, which made the journey out towards Caernarfon on Thursday. All the others (David and Jane Henshaw, Gary Lovell, Graham McDermott and David Edge) were on Bromptons, David Henshaw's being fitted with a Mountain Drive to make towing Alexander's trailer a little easier. This visit to Portmeirion was as enjoyable as ever - many thanks to David and Jane for organising it, and a particular thank you to Gary who undertook the cooking this year. A road test of the Airnimal Chameleon is also available on this web site, and you can find more complete details of the specification on the very comprehensive Airnimal Designs web site at http://www.airnimal.com.